We’d love your help. Let us know what’s wrong with this preview of Skid Out by Ann Marie Frohoff. To ask other readers questions about Skid Out, please sign up. Combining two of my favorite things ever, music and books, SKID OUT was almost sure to please me. And then add in the elements of this story: an up-and-coming teenage rocker, the sweet girl next door, and the outside forces that will surely try to keep them apart. I had a feeling this story would rock my world. It. So. Did. SKID OUT is centered around Jake and Alyssa. Jake is a teenage rocker who is destined for major success. Alyssa is the girl next door that Jake has always seen as a kid, unti Combining two of my favorite things ever, music and books, SKID OUT was almost sure to please me. And then add in the elements of this story: an up-and-coming teenage rocker, the sweet girl next door, and the outside forces that will surely try to keep them apart. I had a feeling this story would rock my world. It. So. Did. SKID OUT is centered around Jake and Alyssa. Jake is a teenage rocker who is destined for major success. Alyssa is the girl next door that Jake has always seen as a kid, until the summer day they cross paths and he realizes Alyssa has grown up. Alyssa is totally unlike the girls who follow Jake and his band. And Jake, just by a look or a touch of his hand, brings about an awakening in Alyssa she's never known before. Will they keep their distance? Or will Jake and Alyssa take a chance? I didn't realize until I was writing this that SKID OUT only takes place one day in the lives of Jake and Alyssa. Author Ann Marie Frohoff packed so much energy, so many feelings into this short story, that it felt as if I had read a full-length novel. I could not get enough of this story. The characters, their dialogue, actions, and emotions were so real and gritty. And, oh my gosh. I freaking loved the dialogue! Frohoff blew me away with the words of her characters. It was spot-on perfection. I couldn't get enough. With it's engaging characters and the anticipation that was steadily built throughout, SKID OUT was a fabulous teaser for a series I am dying to read. Seriously. I need book one, FIRST KISS, yesterday. FIRST KISS, and the HEAVY INFLUENCE trilogy has now become one of my most anticipated books/series of 2012. 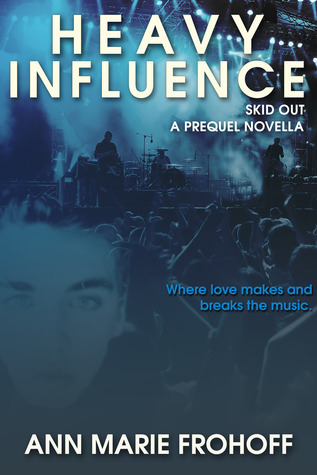 Skid Out (Heavy Influence Trilogy, #0.5) is the novella prequel to the Heavy Influence Trilogy & such a freakin' teaser! In the voice of two characters, Jake and Alyssa, Skid Out starts out in the voice of Jake. Jake's voice is honest & totally 17-year-old-boyish. All throughout the middle it is the fresh & young voice of Alyssa. At the end we swing back to Jake and get another taste of him. I love getting both sides of the story from each of the characters. You get a peek of their feelings & thoughts towards each other. Alyssa is a 14 year old about to be a freshman in high school. She's innocent & sweet & she never noticed how completely hot her next door neighbor, Jake, was until her boy crazy friend, Nadine, pointed it out to her. One afternoon with Jake & her emotions & thoughts are running haywire. & so a crush forms...Alyssa is just hoping not to be completely crushed if things don't go right, because Jake is one guy you can't help but to lust over. I am really looking forward to First Kiss the first in the Heavy Influence Trilogy because Skid Out sucked me in. First Kiss is set to release late spring 2012. The series is a story about young, reckless love between a rising rock star and his younger muse, spanning 10 years of their tumultuous and passionate relationship. Each book in the Trilogy will come with a soundtrack of original music, of which the lyrics will appear in the pages of the books. (Alternative Rock Genre). May appeal to the readers of C.S. Stephens's, Thoughtless series. The synopsis is for the Heavy Influence Trilogy as a whole so Skid Out, the prequel to this series, doesn’t cover all that the synopsis describes. But, this short novella does provide a great glimpse into what this series has to offer. Jake is the hot older guy next door and Alyssa is the young, blossoming freshman. Jake is the front man for a rocking, up and coming band that is about to take off. He’s not lacking in female attention, but his attention lately has been lingering on his next door neighbor Alyssa who’s not so little anymore. Alyssa doesn’t really notice Jake until her friend points out how hot he is, then all she can do is notice him. These two quickly find themselves pulled to one another and enjoy getting to know each other as the people they’re growing up to be. As a novella, Skid Out is short, but it packs a lot of emotion and build up into its brief 56 pages. Author Ann Frohoff has set up her new trilogy nicely in this prequel and has definitely grabbed my interest and attention. The framework for the Heavy Influence Trilogy is deftly erected in Skid Out. This novella only covers the span of a day, but the characters, their personalities, situations, and conflicts are nicely developed and given a solid foundation on which the trilogy can grow. There’s a great edgy realism to Frohoff’s story and characters, and one can tell that this series is only going to get grittier and edgier with each book. The characters are teenagers and they act like teenagers. They curse and whine and say mean things and act overdramatic; they’re three-dimensional and realistic. The dialogue is interesting enough, but I didn’t find it overly refreshing or original. The humor falls a bit flat and some of the dialogue felt awkward. But, what the characters and the story are trying to convey does come through. The story itself plays out how you would expect it to, but this isn’t a bad thing or even a significant thing. From the very first chapters, you easily get a sense of where the story is headed, but I think you’re supposed to because this gives you a clear and complete view of where our characters’ heads are at. The familial relationships are a little stereotypical- distant parents, rivalry among the siblings, snarky teenagers- and I’m hoping Frohoff adds a bit of freshness to these relationships and situations in the series. And by stereotypical, I don’t necessarily mean unrealistic or boring; just predictable. But I do understand the purpose of such familial relationships and their usefulness in bringing our two main characters together and giving them something to bond over. Skid Out ends in a really great way that definitely has me wanting more. Music plays a big role in this novella, and in the series I’m sure, and I think it’s super cool that the books will feature original songs. The original song in Skid Out is “Transpose”, performed by Bad Suns which can be listened to HERE. Skid Out is told from both Jake and Alyssa’s point of views, allowing us an intimate look inside their minds and giving us a chance to really get to know these two. Alyssa is on the timid side, but has a fiery spark inside her, which I liked. Her vulnerability, awkwardness, and habit of embarrassing easily make her endearing. She’s a realistic and relatable 14 year old girl, and she’s easy to like. I found Jake a bit harder to like. He’s a teenage guy, so he’s kind of rough around the edges, but not in an endearing or charming way. He does and says some things that make me want to slap him, yet I get why Alyssa is attracted to him. I think his character is supposed to come off as cool but laid back, cocky but sensitive, confident but genuine. And I did totally get that from and about him, but I think it’s going to take some time for me to warm up to him. I do think there’s more to him than we get to see in this novella and he has the potential to be a really deep, layered character. Frohoff has created a very realistic, believable teenage romance. At this point in the story, Jake and Alyssa are just getting to know each other again and their pull toward one another stems mostly from lust. Their quick attraction reflects the fleeting way many teenage relationships begin and end. And the chemistry between the two is quite palpable. The age and experience difference between the two feels almost like a corporal thing and has a dominating presence, which makes for what is sure to be some excellent drama. A very unique cover. I love the guy's face being covered with the black colour and how we only get to see a part of the face. Very interesting and looks like a mysterious guy indeed! I thoroughly enjoyed it! I always loved reading about guys in bands and girls falling for the guy, especially since their childhood friends. I've always wanted to experience that kind of love where you started to look at your childhood friend in a different way, more than friends and you find yourself starting to fall for him/her. Since Skid Out is just a prequel of the Heavy Influence trilogy, there is not really much going on but the characters were introduced. This is one unique novel and I was really glad I got the chance to review it. Why? Because there's an MP3 song that comes with it and I ABSOLUTELY adore it. The song was great and it was actually meant to be a song written by one of the characters. The lyrics also comes in the novella and I really love it. The ending made me really intrigued in reading what the Heavy Influence trilogy will be about! I enjoy the characters since they're childhood friends and their attraction built after spending much time together. Jake, the main character is also a band member and he writes awesome songs. Alyssa, his childhood friend is just an average girl but I can easily connect to her and understand her 'sudden' interest in her own childhood friend! A very unique novella that comes with an awesome song you can listen to while reading the book! Surely you're interested in listening the song now, heh? Go and grab the book. If you buy it, you can email heavyinfluencetrilogy@gmail.com with your receipt copy and you can grab the song. It's completely awesome. I can't wait for the book trailer too which is still on its making process! What makes this novella different than the other 'music themed' novels is it actually comes with the music mentioned in the story whichy you can listen to! Definitely recommended. Thank you to Ann for giving me the chance to review her novella! Absolutely looking forward to the Heavy Influence Trilogy! 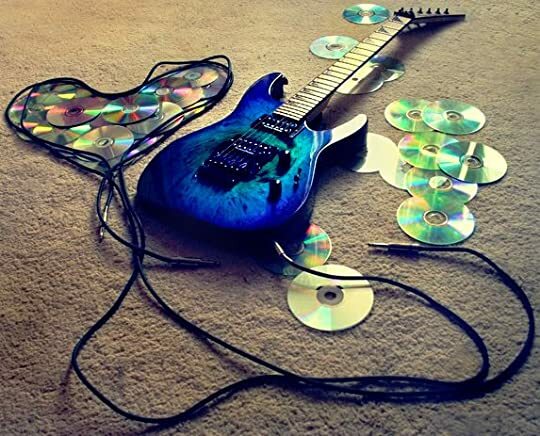 In this brilliant novella we get a taste of teens loving music; maybe even getting the big break in the music industry that they have been waiting for. And all the while could there be romance blooming? Right next door. Alyssa is such a young girl for Jake's older eyes. Yet that isn't stopping his mind from thinking about her or his eyes from wantin Okay. So, we have the perfect mix here. Music, high school, California, hot guys -- (bad boys?) hot girls. (good girls?) What else could we ask for? Thank Heaven for bloggers that share! Thanks to Auntunm (www.autumnreview.com) I just finished reading Skid Out. This novella is about Jake, a rising musician that takes notice of the girl next store who is no longer a 'little' girl. Alyssa remembers Jake from the days he spent hanging with her older brother. Now that she's fourteen he makes her giddy and she can't believe there was a time that he use spend the night at her house. So what happens now? I'm going to have a hard time waiting for th Thank Heaven for bloggers that share! Okay, so. Jake and Alyssa's story is short, but a sweet one. It portraits love in a usual, but new way. It felt real. The characters, their emotions, the situations they were in. And I think you should give it a chance because I'm sure this was only the beginning and the trilogy will be awesome. I am not a huge fan of YA books but I rather enjoyed this little novella which is the prequel to First Kiss, which I definitely will be reading...so this gives you a bit of a back-story on how Jake and Alysa started out. Rock stars, music, first love....am really looking forward to this series. Skid Out is a novella (it's around 46 pages) and it's a prequel to a novel soon to be released, First kiss. And obviously it ends when things really start to get interesting and I need to know how it goes on because… okay, wait, let's start again. The main characters of the story are Jake and Alyssa. Jake is a senior, is in a band which has a good success and he's a quite interesting boy when it comes to looks (and that's why he attracted the attention of more than a girl). Alyssa is a very young girl that has to start high school and who is starting to notice guys. And obviously she notices her neighbor Jake, a musician, a cute musician and older than her. The story is narrated by the point of view of Jake and Alyssa and it's nice. I think there's a lot more in store for us in the novel. I love the role music plays (and it's a big one) and I've always had a weak spot for musicians, so Jake is really intriguing. Okay, he seems like a jerk ready to break your heart, but that's okay. Alyssa is the typical teenager and she's about to get a huge crush. Can't wait to see how the thing will play out. As far as narration is concerned, I was kind of… surprised. To be honest, the language wasn't quite what I expected. I'm not being negative, it's just that reading many YA books, I've always noticed that language is not very often as… let's say direct, yes… so, as direct as it usually is in real life. There are quite a lot of swear words and innuendos and I felt it was really realistic. Teens do speak that way (at least in here) so I felt it was a good choice. The ending is really annoying, though. Why? Because there's a huge cliffhanger! It ends when things get interesting! That's not fair! I want more! OF COURSE I'll be reading the first book of this series, because the novella made me want to know more. Oh, there's an mp3 coming together with the novella. Isn't that wonderful? I really feel music is important in this story and I loved it! "I don't think I'm cool enough to eat here." Skid Out è una novella molto breve (circa 46 pagine), prequel a un libro che tra poco uscirà, First Kiss. E ovviamente finisce sul più bello e io ho bisogno di sapere come continua perché… facciamo un passo indietro e ricominciamo. Protagonisti della storia sono Jake e Alyssa. Jake è in una band che ha un discreto successo, è un ragazzo alquanto interessante dal punto di vista fisico (e infatti ha attratto l'attenzione di ben più di una ragazza) e Alyssa è una ragazza giovanissima che deve cominciare il liceo e che sta appena cominciando a notare i ragazzi. E ovviamente finisce per notare il suo vicino di casa, musicista, bello e più grande. La storia, narrata dal punto di vista di Jake e di Alyssa, sembra carina e promette bene. Mi piace molto il ruolo prominente della musica e ho un debole per i musicisti, quindi Jake mi intriga, anche se sembra proprio il classico str… ahem, classico ragazzo che ti spezza il cuore. Alyssa invece è la tipica adolescente che sta per prendersi una cotta colossale. Sarà interessante vedere come andrà a finire questa cosa. Per quanto riguarda lo stile narrativo sono rimasta… sorpresa. Ora, devo essere sincera? Il linguaggio mi ha stupito. Nonostante i protagonisti siano adolescenti, ci sono parecchie parolacce e molte allusioni al sesso, cosa che solitamente non accade molto negli YA. Certo, l'ho trovato parecchio realistico. Insomma, è molto più probabile che gli adolescenti parlino in quel modo che con un linguaggio perfetto, no? Il finale della storia invece è irritante. Perché? Perché finisce proprio quando le cose si fanno interessanti? Non vale! Non si può! Ovviamente leggerò il primo libro di questa serie, perché mi ha stuzzicato e voglio vedere come prosegue. Cosa carinissima, la storia ha in allegato un mp3 musicale, quindi si può proprio dire che la musica gioca un ruolo fondamentale in questa serie! Graditissimo e molto apprezzato! This was a really quick read that I enjoyed a lot. Jake is in a band that seems to be going places and it's the summer before his senior year of high school. This novella lets us get to know Jake a little and also his neighbor Alyssa. I really liked each of the characters and thought that it was a good set up to go into the first book in the Heavy Influence trilogy. We get music, a little bit of drama, and a first look at what I think is going to be a fantastic romance. Jake is a singer in a band This was a really quick read that I enjoyed a lot. Jake is in a band that seems to be going places and it's the summer before his senior year of high school. This novella lets us get to know Jake a little and also his neighbor Alyssa. I really liked each of the characters and thought that it was a good set up to go into the first book in the Heavy Influence trilogy. We get music, a little bit of drama, and a first look at what I think is going to be a fantastic romance. Jake is a singer in a band. He's gorgeous, funny, and charming. The band is going places, in fact they will be recording with a major producer and going on tour. Jake has his hands a bit full though with Rachel. She has been his friend forever, but in a drunken stupor he gave into her advances and now she thinks that they are something more. I really wished that he would just man up and tell her that he doesn't like her and it's never going to happen between them, but he's only 17 and I can understand where he is coming from. He also now has noticed that little Alyssa has grown up and he is taking an interest in her. Alyssa is fun. She seems to have no filter when it comes to keeping her thoughts in and it's super entertaining. It's funny because although she has been crushing on Matt, she never really thought of herself as boy crazy. Now it seems as though her hormones are in overdrive. (Which they probably are) She is totally into Jake and she doesn't know how to stop it. A boy who she used to spend time with all the time is now a hot budding rock star and she can't help but want him. I do really respect her feelings for her friend who is really into Jake too, but the sneaking is only going to backfire and I think she should just come clean about it. First I would like to thank Annie Frohoff for emailing me a copy of Skid Out and the Mp3 that goes along with it. I listened to the song, "Transpose", before diving into the story of Jake and Alyssa and I found that it was a nice touch. So, thanks again for giving me the opportunity to read and review your book! Skid Out is the prequel novella to the Heavy Influence Trilogy, and it is pretty radtastic! In this short novel, we are introduced to the two main characters: Jake and Alyssa. Jake is the First I would like to thank Annie Frohoff for emailing me a copy of Skid Out and the Mp3 that goes along with it. I listened to the song, "Transpose", before diving into the story of Jake and Alyssa and I found that it was a nice touch. So, thanks again for giving me the opportunity to read and review your book! Skid Out is the prequel novella to the Heavy Influence Trilogy, and it is pretty radtastic! In this short novel, we are introduced to the two main characters: Jake and Alyssa. Jake is the lead vocal and guitarist in a band that's in the early stages of taking off, and Alyssa is his younger next door neighbor. The attraction between these two is both unexpected and undeniable. I really enjoyed the fact that this novel was from the perspectives of both of them; and I appreciated the fact that the author was able to keep their point of view's from bleeding together, because the characters are two unique individuals. Jake seems like a great guy. He's focused and committed to his band. His attraction to Alyssa is a little heartbreaking on one hand because he seems to be battling with himself about how to handle his feelings for her, since up until now she was only ever the kid sister of a friend. Alyssa is also confronted with the same degree of feelings and possible doubt about their budding relationship. She's young and inexperienced, and Jake has inadvertently awakened a part of her that she never knew existed. These two have me hooked, and I'm extremely interested to see where their road to first love will take them. I recommend this book to anyone who appreciates music and wants to read a believable story about life and love, among other things. This prequel gave me a taste of what is sure to be a fantastic story, and it left me wanting so much more. I will definitely be on the lookout for the Heavy Influence Trilogy because I can't wait to see what Jake and Alyssa will become. As a prequel to the Heavy Influence trilogy, Skid Out did its part as a very tempting foretaste of an interesting and intoxicating story and another swoon-worthy literary crush to come. I rated this prequel 4-stars, not because I love fictions with rocker guy characters or because Jake Masters is an utter hottie (although, yes, both reasons were considered), but because the story was downright stimulating. However, I took off a star because I think it lacked a bit of thought-provoking moments. Skid Out is just a taste of what is to come, and I just can't wait to read what is coming. The 56 page novella is a quick view into how Jake and Alyssa's relationship starts. It might be a short novella, but I just couldn't stop reading once I started, which was right after I listened to the MP3 for Transpose, which I continued to listen a few more times while I was reading. It was an excellent touch to get you into the world of an up and coming band. Ann Marie Frohoff describes so well the teenag Skid Out is just a taste of what is to come, and I just can't wait to read what is coming. Ann Marie Frohoff describes so well the teenage crush, that idolization of the object of that crush especially when he is a little older. I'm a sucker for books narrated by the male lead, so I really enjoy reading the dual narration, even though at times I wanted to see more of Jake's perspective. The characters are interesting, even though that I like Jake friends more than Alyssa's, but we'll see how that changes as the series progresses. This is mainly because it seems that even though Jake friend show for less time they have more presence, were Alyssa’s friend seem flaky. But hey that might be part of their personalities, again will see where the story takes them. As for our leads Alyssa and Jake, so far we got a very good intro to who they are and got a glimpse at what makes them tick. We got a nice background, two old friends that use to hang out together watching movies and the likes until they started to grow apart. And now life throws them back together a little bit older and now noticing how the other has changed and grown up. As I was reading I wanted to know more about Alyssa and Jake, and what was going to happened between them. And I have to say it wasn't enough I wanted more. First I have to say Amy Del Rosso I LOVE LOVE LOVE YOU for telling me about Skid Out. I had it in my kindle and have been meaning to read it but as everyone who blogs knows lord help us when we take on all the tours and all the review books you forget which ones you wanted to read. So when Amy told me she was doing the blog tour for the first book I was so excited I jumped at the chance to be a part of that tour. In Skid Out which is the Novella for First Kiss we get to meet Jake and the band mem First I have to say Amy Del Rosso I LOVE LOVE LOVE YOU for telling me about Skid Out. I had it in my kindle and have been meaning to read it but as everyone who blogs knows lord help us when we take on all the tours and all the review books you forget which ones you wanted to read. So when Amy told me she was doing the blog tour for the first book I was so excited I jumped at the chance to be a part of that tour. In Skid Out which is the Novella for First Kiss we get to meet Jake and the band members as well as Aly who is a main character in this series. Jake is an up and coming musician and his band is going on tour the summer before his senior year in high school. What a dream come true for the band and they are very excited to be touring. Jake is looking forward to rocking out to some new tunes the band has put together but what Jake didn't prepare himself for was falling for anyone. Sure he has had lot's of girls and he has partied with the best of them but when one night of misjudgment and loneliness causes him more aggravation he is soon regretting hooking up with this girl because she proves to him she can't handle being with him. Jake does not do possessive and controlling girls. Plus he has been seeing his neighbor Aly a lot lately and she even though they were best friends growing up they drifted but Jake is now seeing the grown Aly and he is definitely liking what he is seeing. This novella has only 56 pages--short but really good! I didn't know what to expect when I agreed to read it but I'm glad I did. I just knew that it would be a short read, but I never thought that I would enjoyed it so much. The story gives us a glimpse of both Jake and Alyssa's life. What it was like for Jake to be the front man of a rising rock band as he'd come to realize that his feelings for his younger neighbor Alyssa is something he could no longer ignore. Then he began to make decisions t This novella has only 56 pages--short but really good! I didn't know what to expect when I agreed to read it but I'm glad I did. I just knew that it would be a short read, but I never thought that I would enjoyed it so much. The story gives us a glimpse of both Jake and Alyssa's life. What it was like for Jake to be the front man of a rising rock band as he'd come to realize that his feelings for his younger neighbor Alyssa is something he could no longer ignore. Then he began to make decisions that soon will affect everything he worked so hard to achieve. If you happen to have doubt about this book, I'd say give it a try. You most likely end up enjoying it. I easily loved the main characters, they're true to their feelings and that made them very likable. Seeing the story in both Jake and Alyssa's POV made me understand them well enough, and I was glad to see how their feelings for each other started to flourish. I was even more thrilled to see Jake's written composition in the last part of the novella--the lyrics and the music fits the story perfectly, and the original mp3 music (which I listened to the nth time after reading the book) makes the story seem even more intense and real. It still gives me chill whenever I listen to it. I can't wait to see what will happen next and I'm sure to be one of those fans who will eagerly anticipate for the next book. Skid Out was like an appetizer before a three course meal. Just enough to whet the reader's interest in the forthcoming trilogy and leave you wanting more. Frohoff's edgy prequel introduces us to Alyssa and Jake. Jake is celebrating the summer before senior year and the success of his fast rising rock band. Alyssa, the girl next door is looking forward to starting high school in the fall and remembers Jake as the boy she grew up falling asleep next to as they'd watch TV late into the night. But Skid Out was like an appetizer before a three course meal. Just enough to whet the reader's interest in the forthcoming trilogy and leave you wanting more. Frohoff's edgy prequel introduces us to Alyssa and Jake. Jake is celebrating the summer before senior year and the success of his fast rising rock band. Alyssa, the girl next door is looking forward to starting high school in the fall and remembers Jake as the boy she grew up falling asleep next to as they'd watch TV late into the night. But when Alyssa and her friend happen upon him washing his car shirtless, life as they know it is forever changed and Alyssa is sprung. Told from both main characters points of view, Frohoff did a good job of distinguishing their voices. I was never confused about who was narrating at any particular time in the story. Alyssa narrated the bulk of the short story and her wide eyed excitement and innocence was endearing. It's a given that hottie Jake has been around the block a few times paving his way with drunken hook ups, but he's clearly interested in Alyssa as more than that. Can he live up to Alyssa's expectations or will the lure of a rock stars lifestyle be too much? I for one can't wait to stage dive into all the romance, drama and music the Heavy Influence trilogy promises to be. Jake is 17 and on the fast track to becoming a huge success in the music world. Alyssa is his 14 yr old next door neighbor; the younger sister to his once best friend. It has been years since they hung out but Jake is starting to see Alyssa in a different light. After spending one day together he realizes he has feelings for her and wants to know everything about her. A couple minutes is all it took for Alyssa to notice that Jake is more than just her older brother’s old best friend…and boy does Jake is 17 and on the fast track to becoming a huge success in the music world. Alyssa is his 14 yr old next door neighbor; the younger sister to his once best friend. It has been years since they hung out but Jake is starting to see Alyssa in a different light. After spending one day together he realizes he has feelings for her and wants to know everything about her. A couple minutes is all it took for Alyssa to notice that Jake is more than just her older brother’s old best friend…and boy does he smell good too. If First Kiss is anything like Skid Out...then it is going to be friggin awesome. I was floored at how much more I craved of the story after finishing this 50 some odd page novella. No lie…I was hooked on these characters just pages into the book. Frohoff did a great, nay, a stupendous job getting the attention of her readers…teasing us with just a few well written pages. The buildup to First Kiss is huge! I am that far gone…wanting, needing First Kiss. I am absolutely, positively looking forward to what all will transpire between Jake and Alyssa and everyone involved. This wonderful prequel pulls you into the story and amerces you in the life of a freshmen and a senior in High School and a blossoming love story. I can't wait to read the book as soon as it comes out. I need more of t When I sat down to read Skid Out and turned on the amazing song that came with it, I was hooked as soon as the first notes came through my speakers and I read the first line of the book. I was stuck into my seat till I read the very last word and was begging for more of the story. The Heavy Influence series seems to be a rocker romance with lots of tension, strain on relationships, emotions and angst. The author did an excellen Skid Out is a novella prequel to the Heavy Influence Trilogy by Ann Marie Frohoff. This was the perfect teaser to give the coming stories a little history. In Skid Out we are introduced to Jake Masters and Alyssa Montgomery. The Heavy Influence series seems to be a rocker romance with lots of tension, strain on relationships, emotions and angst. The author did an excellent job setting up the story with this novella. If you’re interested in seeing where the story began before getting into the trilogy, grab this one and give it a try! Coming....but wow I love it!!! I truly loved it! Amazing prequel!!! Cant wait for The first book to come!!! Skid Out is the novella prequel to the heavy influence trilogy and introduces us to all the characters in the trilogy. It follows Jake and his band and the girl next door Alyssa ‘Aly’ who finally gets noticed by the guy next door. Only problem is that she 14 and not allowed to date until she is 16 and he’s 18 and about to hit the big time. His band is about to go on tour before school starts and they have been looking forward to it for months. So when he notices Aly, it threatens to wreck his ca Skid Out is the novella prequel to the heavy influence trilogy and introduces us to all the characters in the trilogy. It follows Jake and his band and the girl next door Alyssa ‘Aly’ who finally gets noticed by the guy next door. Only problem is that she 14 and not allowed to date until she is 16 and he’s 18 and about to hit the big time. His band is about to go on tour before school starts and they have been looking forward to it for months. So when he notices Aly, it threatens to wreck his careful plans. It also upsets Rachel, the girl who has been a fan of the band helping out because he got together with her one night and now she wants something out of it and is making her attentions clear. He should not hang around Aly and Jake is torn because he never thought that he would feel something like he does for the girl. He’s messed up about Aly but determined to have everything. For Aly , all she wanted was to get serious with her friend Matt, who she’s been interested in for months as Jake had just been the boy next door to her. So when Nadine, her best friend, comes over and starts acting weird around Jake, primping and such, it’s clear that she’s interested in him. But as they start hanging out, it’s Aly that gets invited around and soon she’s sneaking out to see him, seeking trouble as her sister Allison starts to get wind of things and warns her. It’s cute; I love a rocker and hadn’t had a chance to read a YA book that covers this topic and this story even has music to go along with it so you get an idea of the music the band plays. As I write this, I’m playing the song that the author used in the book and I must say the author chose a perfect introduction to this band. I’m in love with this music, the story and the characters. Already from this novella I’ve gotten a great sense of the plot and I must say things are going to get very interesting during the summer between the characters. Ann Marie was nice enough to send me a copy of "Skid Out", the prequel to her upcoming Heavy Influence Trilogy, and the accompanying mp3 "Transpose". The story is about 17 year old Jake and his upcoming tour with his band, so I thought it was really original that her stories are accompanied by original songs that have lyrics featured within the book. The prequel is just 56 pages long, but it does an excellent job setting up the story to come. We are introduced to both Jake and his neighbor Alyssa Ann Marie was nice enough to send me a copy of "Skid Out", the prequel to her upcoming Heavy Influence Trilogy, and the accompanying mp3 "Transpose". The story is about 17 year old Jake and his upcoming tour with his band, so I thought it was really original that her stories are accompanied by original songs that have lyrics featured within the book. The prequel is just 56 pages long, but it does an excellent job setting up the story to come. We are introduced to both Jake and his neighbor Alyssa. A little back story is worked into both of their narratives, so we understand their relationship better. Alyssa is just starting high school and suddenly notices Jake, and how cute he's become. They talk a little bit outside their houses and Alyssa start's to develop a crush. Jake has always been aware of Alyssa, once upon a time they were good friends, but it isn't until recently that he's really started seeing her. They spend some time hanging out and Jake keeps trying to convince himself that there can't be more going on. He's about to go on tour and it would just complicate things. I happened to be reading lots of rock/ music themed stories this summer, and when I saw this one come across my twitter timeline, I thought I would give it a try. As an introduction to the characters in the upcoming books, I thought this short worked very well. I gave this 4 stars mostly because when I got to that last page on my kindle, I kept pressing "next page" for more! By the end, I was hooked on Jake and Alyssa, and I want to know what happens between them. While there isn't any "oh wow" I happened to be reading lots of rock/ music themed stories this summer, and when I saw this one come across my twitter timeline, I thought I would give it a try. As an introduction to the characters in the upcoming books, I thought this short worked very well. I gave this 4 stars mostly because when I got to that last page on my kindle, I kept pressing "next page" for more! By the end, I was hooked on Jake and Alyssa, and I want to know what happens between them. While there isn't any "oh wow" moments in this, I did enjoy it and will be looking forward to the official first book in this series. She’s now settled in the South Bay area of Los Angeles wit Ann Marie ("Annie") Frohoff grew up in sunny Southern California. As a teen and young adult she spent her time frequenting and living in nearly every beachside city up and down the coast. She settled in Hollywood at 19 working in film and TV. Soon her itch to keep moving took over again, taking her to Hawaii for a time and then back to LA.